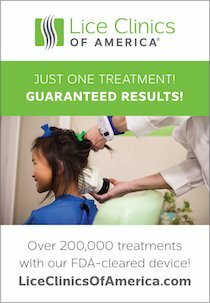 Head Lice Help: What Do I Do Now? If you can easily afford it, look for a professional service in your area. These people know what they're doing and can take care of the problem fast. Choose a service with a guarantee. If pros aren't an option (true for most of us), DON'T PANIC. This is not difficult or scary. I promise! Just be thorough. Come home and treat with Licefreee or enzyme shampoo (or just lots of regular hair conditioner on wet hair, if you don't have either yet). Conditioner won't kill the bugs like Licefreee, or dissolve nit glue like an enzyme shampoo, but it will make combing easier. Follow the instructions here on how to remove nits. You'll be combing out both the bugs and their eggs. This is not hard, just painstaking. Continue to check your kids' heads daily after comb-out, just to make sure you got everything. Repeat comb-out if you find even one missed nit. My family's second bout with head lice came three years after the first encounter. (When we had finally slacked off on our preventative measures.) With the second and third bouts behind us, I'm ready with my comb, enzymes & sodium chloride spray, just in case we ever do get lice again. Check out our photos ... What Do Lice Look Like?